As many as 1.5 million inactive registered names on the voter rolls in Los Angeles County alone are being contacted for potential removal, after the recently-announced settlement of a lawsuit against the state of California and Los Angeles County initiated by Election Integrity Project California (EIPCa) and Judicial Watch. Inactive voters who have not voted in two general federal elections will receive a postcard in the mail, and if the postcard is not returned, those names will be removed from the voter registration list. The entire process of cleaning the voter rolls of deceased and other ineligible voters will take up to eight years, according to Linda Paine, president of EIPCa. Finally!! California Agrees to Begin Cleanup of its Voter List! “This is powerful. This is historic. 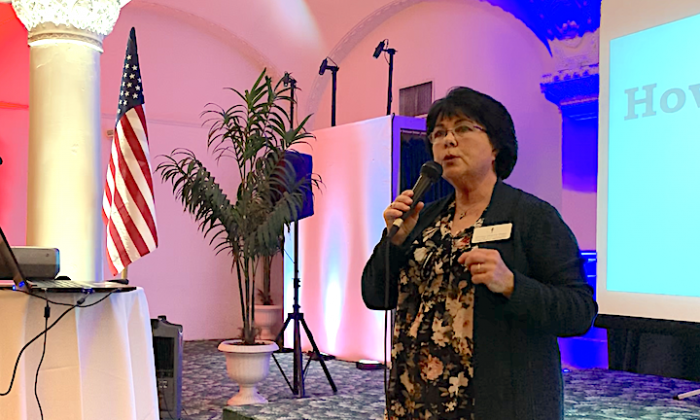 This has never happened in the state before, where a citizen group documented, researched, and sued the state of California and the LA County Registrar to ensure that they become compliant with federal law, so this is huge,” said Paine at the meeting. In August 2017, EIPCa filed the lawsuit as a primary plaintiff, alleging “that the defendants were not following the requirements of Section 8 of the 1993 National Voter Registration Act (NVRA). The NVRA requires states to reasonably maintain state and county voter registration rolls. The mandates of this settlement, when performed, will bring California into federal compliance as is required of every other state,” according to a press release. The lawsuit found that California has not cleaned up its voter rolls for more than 20 years. A 2018 Supreme Court ruling also confirmed the voter registration cleanups were mandatory under the NVRA. Dean Logan, Los Angeles County’s registrar-recorder and county clerk, responded to the settlement in an emailed statement to The Epoch Times on Jan. 14. “Los Angeles County prioritizes the maintenance of voter records and works hard to maintain protections that ensure eligible voters stay on the rolls in compliance with state and federal voter registration laws. In settling this lawsuit, all parties agree that they each had a good faith interpretation of the National Voter Registration Act (NVRA) requirements, state law, and federal law regarding voter file maintenance,” read the statement. Logan also said the settlement included no admission of wrongdoing, and he claimed that Judicial Watch was “inaccurate” in alleging Los Angeles County has a registration rate of 112 percent of its adult citizen population. Judicial Watch has stated this information was provided to and published by the U.S. Election Assistance Commission. The 2016 National Voter Registration Act report issued by the Election Assistance Commission (EAC), reported that California was one of nine states that had more people registered to vote than were eligible, with a 100.1 percent registration rate. The EIPCa has been in operation in different forms since 2010 and has trained a total of 9,000 citizen volunteers to observe California’s voting process, according to Paine. For eight years, the organization has documented and compiled witness statements and election data, as well as identifying any potential problems in the process. All of the data obtained by EIPCa is kept off the internet and on a secure server, so it’s protected from hackers. “Because of the powerful and overwhelming evidence provided by EIPCa, this was an exceptionally strong case,” said Paine of the recent lawsuit. As well as continuing to provide independent oversight of election data, Paine said the group is now planning a “deep audit” of provisional and vote by mail ballots in the 2018 general election. “We are very concerned with the tens of thousands and potentially hundreds of thousands of citizens who did not get their vote by mail ballot,” said Paine. Paine said some of those voters went to the polls to vote, but they found they were switched to vote by mail without their knowledge or permission. However, they never received ballot in the mail. Others were all set to vote by mail but never received a ballot either. Both groups had to vote with provisional ballots. “We have some who tell us that they went to the polls to vote having not received the vote by mail ballot, anticipating voting with a provisional ballot, only to find that the clerk said, ‘But you did turn in your vote by mail ballot. We have it indicated right here that it’s been processed.’ We’d like to find out how many vote by mail ballots have a corresponding provisional ballot,” said Paine. The group plans to do the audit for every county in California. “Our chief analyst told us that LA County had a 400 percent increase in the use of provisional ballots. It created chaos in the polls, and it was a disaster,” Paine added.